Virtually all scholars agree that apocalyptic and millenarianism formed at least part of the matrix of the culture in first-century Jewish Palestine, but there is a sharp disagreement concerning the extent to which Jesus shared apocalyptic and millenarian beliefs. Although there has been a great deal written defending or opposing an 'apocalyptic Jesus', almost nothing has been said on the questions of what, from the standpoint of modern historiography of Jesus, is at stake in the issue of whether or not he was an apocalypticist or a millenarian prophet, and what is at stake in arguing that his alleged apocalypticism is a central and defining characteristic, rather than an incidental feature. Much has been said on the kind of Jew Jesus was, but almost nothing is said on why the category of Judaism has become so central to historical Jesus debates. These questions have less to do with the quantity and character of the available ancient evidence than they do with the ways in which the modern critic assembles evidence into a coherent picture, and the ideological and theological subtexts of historical Jesus scholarship. Scholars of Christian origins have been rather slow to inquire into the ideological location of their own work as scholars, but it is this question that is crucial in achieving a critical self-awareness of the larger entailments of historical scholarship on Jesus and the early Jesus movement. This volume begins the inquiry into the ideological location of modern historical Jesus scholarship. John S. Kloppenborg is Professor and Chair of the Department for the Study of Religion at the University of Toronto. Recent publications include (with Richard S. Ascough), Attica, Central Greece, Macedonia, Thrace, Vol. 1 of 'Greco-Roman Associations: Texts, Translations, and Commentary' (2011) and Q, The Earliest Gospel: An Introduction to the Original Sayings and Stories of Jesus (2008). 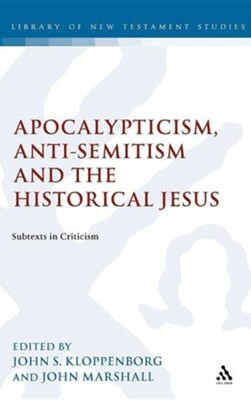 I'm the author/artist and I want to review Apocalypticism, Anti-Semitism and the Historical Jesus: Subtexts in Criticism.